Animal prints were having a major moment as they dominated FW18 runways and reappeared massively not only on the SS19 catwalks, but also on the streets and social media feeds. Interest on Google Trends for “animal print” registered increase of 2x from SS18 until to-date in SP19. In this report, we explored how animal prints were adapted, transitioned and performed over multiple seasons on the retail front. 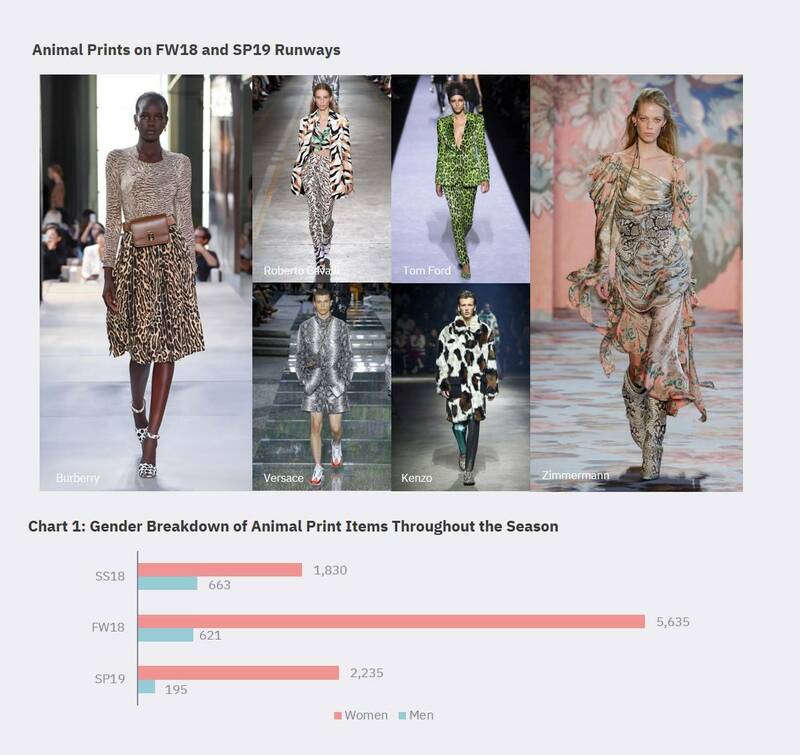 More than 400,000 data points were screened across womenswear and menswear from 5 of the top fast fashion e-tailers – ASOS, Zara, Boohoo, Mango and Urban Outfitters, and narrowed to in-depth analysis on 22,179 animal prints SKUs. While animal prints are undoubtedly more synonymous to womenswear, menswear has been riding the animal print wave since 2017 as seen on the runways of Stella McCartney and Dolce & Gabbana. While this print was also embraced by fast fashion retailers, the number of animal print items in menswear throughout the seasons were in decline (refer to Chart 1). In contrast, womenswear new-in on animal printed items jumped 3x more in FW18 against SS18 while SP19 numbers were 5x more than a year ago, proving that the trend showed no signs of waning. Overall, total new-in animal print items showed an upward trend across the 3 seasons (refer to Chart 2). The prints were stocked aggressively starting August 2018 to gear up for Fall and peaked in November. A slight dip was seen in December before rising again in SP19, starting on a much higher base compared to a year ago with a steady growth trajectory. 22,179 animal prints SKUs were identified based on product names as defined by the e-tailers. While a significant number of items were simply named “Animal Print”, 60% – 70% were precisely tagged as leopard, snake, tiger or zebra print (refer to Chart 3). “Others” includes cow, giraffe and cheetah prints. The ever-classic leopard print unsurprisingly reigned as the most popular print stocked by retailers in 2018. It contributed 39% of the total animal print items added in FW18, making it the highest. Increasing niche contenders such as snake, zebra and tiger prints are challenging the feline print’s position, especially snake print. The fast fashion brands were consistently dropping pieces covered in snake print, increasing steadily from SS18 to FW18, before claiming the same share as leopard print in SP19 at 26%. This recent fixation on the reptilian print was made popular, thanks to the FW18 runways from Marni’s trench coats to Zimmermann’s snake print boots. Women’s Tops and Dresses were the largest contributors to animal prints, with 40% newness each season from the 5 retailers analysed. Both categories’ new-in assortment quadrupled in FW18 with Dresses surpassing Tops, albeit marginally. Meanwhile, Shoes was the largest accessory decked in the wild prints, also seeing a consistent injection throughout the seasons. As retailers began to stock more of items in other animal prints such as snake, zebra and tiger, especially during FW18, sell-out rate at full price nonetheless hovered at approximately 20% on average. Tops performed steadily with peaks in May and October ’18 before trending downwards beginning the end of FW18. 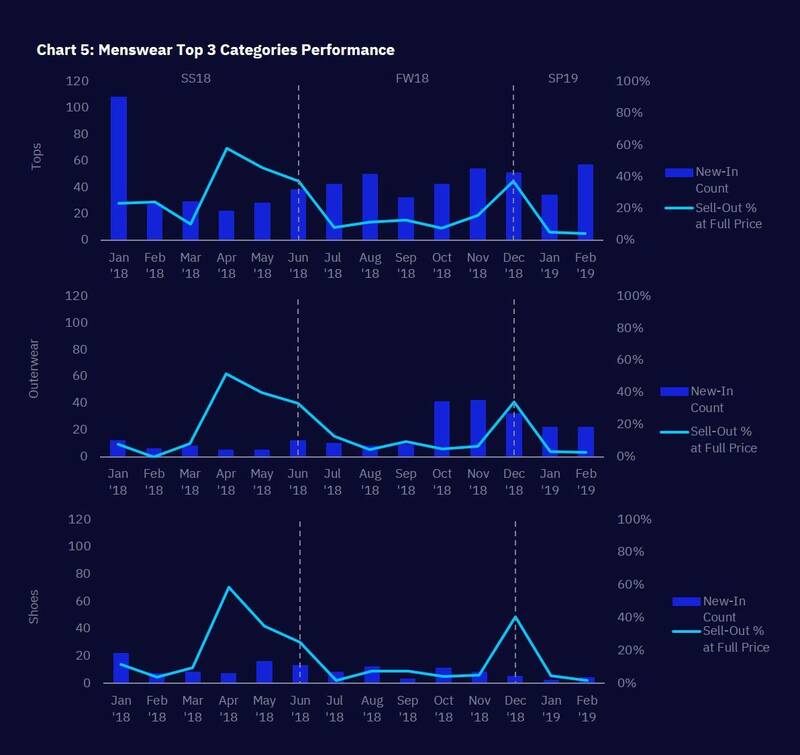 The category also failed to achieve a positive off-take starting SP19, sell-out rate in Feb ‘19 was well below last year Feb ‘18 by 9 percentage points. Meanwhile, Dresses had similar sell-out movement as Tops in SS18, the category peaked in July ’18, before declining throughout FW18 and SP19. Having said that, SP19 to-date observed marginally higher sell-out than same time last year. Shoes also performed well in SS18 with the highest sell-out achieved at 32% in May ’18. However, as retailers increased newness during FW18 and SP19, sell-out trended downwards ending Feb ‘19 with 5% rate. Men’s Tops, Outerwear and Shoes were the top 3 biggest contributors for animal prints in terms of new-in. Tops in particular, was the biggest category offering this wild print trend, contributing to almost 50% of the total new-in. Having said that, retailers remained cautious in stocking up on this category (refer to Chart 5). Outerwear and Shoes were also stocked at relatively low quantity, although new-in for outerwear increased 5x more in October ‘18. 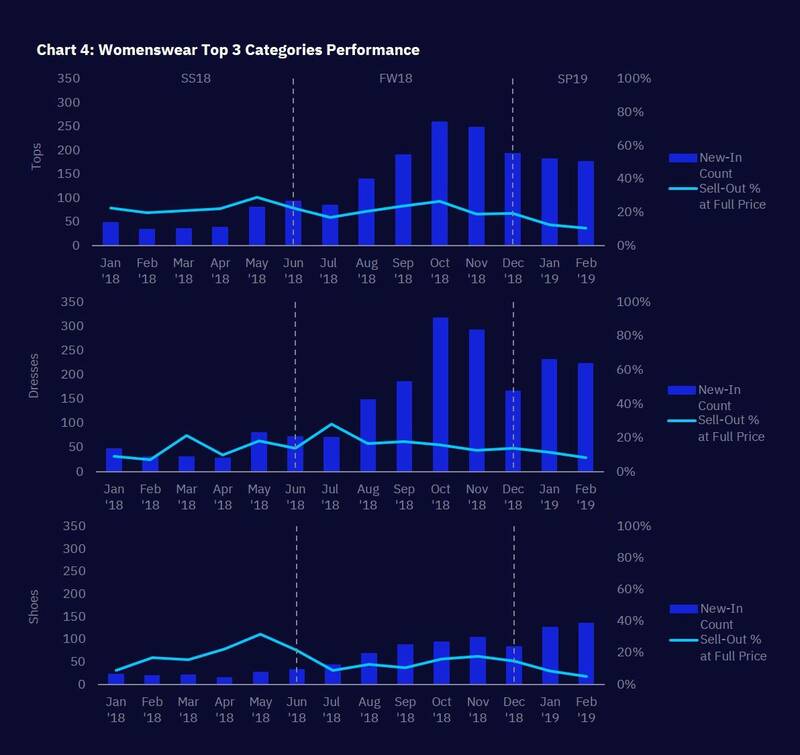 The 3 categories had similar sell-out rate pattern, whereby the rates peaked in April ’18 in summer at around 60% but subsequently decreased throughout FW18 before peaking again in Dec ‘18. 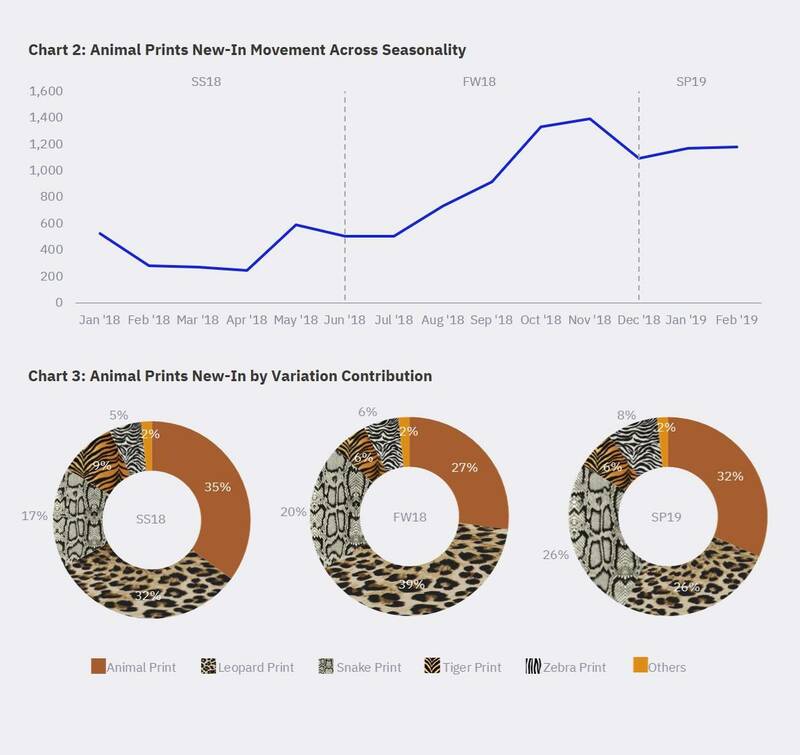 Menswear animal printed items were not off to a good start in SP19 however, with mere 3-5% sell-out rates at full price respectively, especially Tops which saw a huge 20 percentage points decline against last year (Feb ‘19 sell-out rate 4% vs. Feb ‘18 sell-out rate 24%). 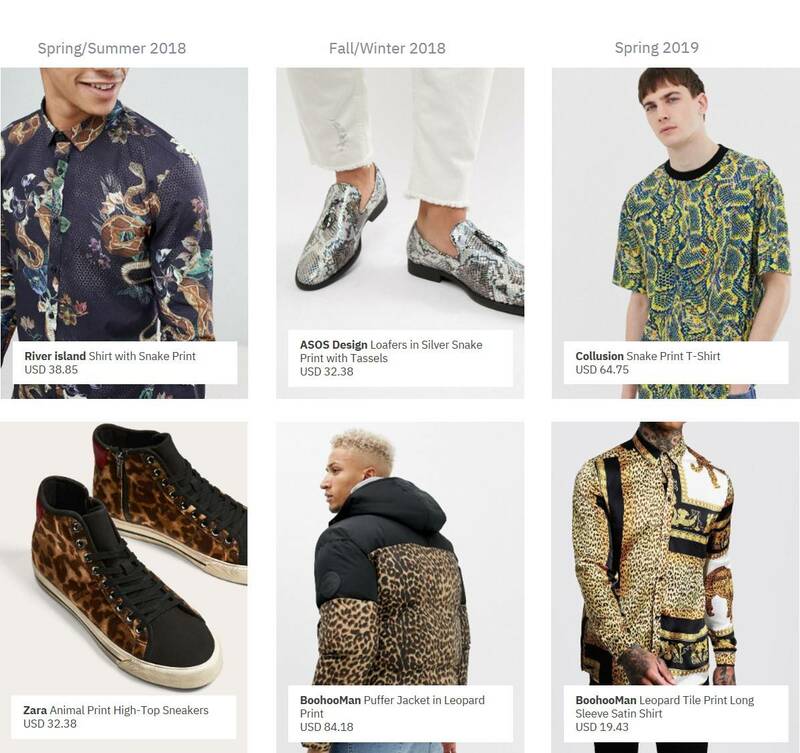 Despite the overall low product count, menswear animal print items’ performance failed to catch up with the hype, despite strong representations on the catwalks and call-outs on social media. The classic leopard print still accounted for the biggest sold out SKUs for animal prints, further strengthening its popularity and versatility. Although this feline spots were present and continuously captured the biggest slice of sell-outs every season, there was also demand for other prints such as snake and zebra. The bestsellers list in SS18 saw mainly leopard prints taking centre stage in the neutral shades of deep caramel and brown tones, as seen here in Zara and Motel. While there was a huge entrance from other prints such as zebra and tiger in FW18, snake print was a clear crowd favourite. Aside from the usual black, grey and white, the print was also well-received in vibrant colours such as red and yellow. 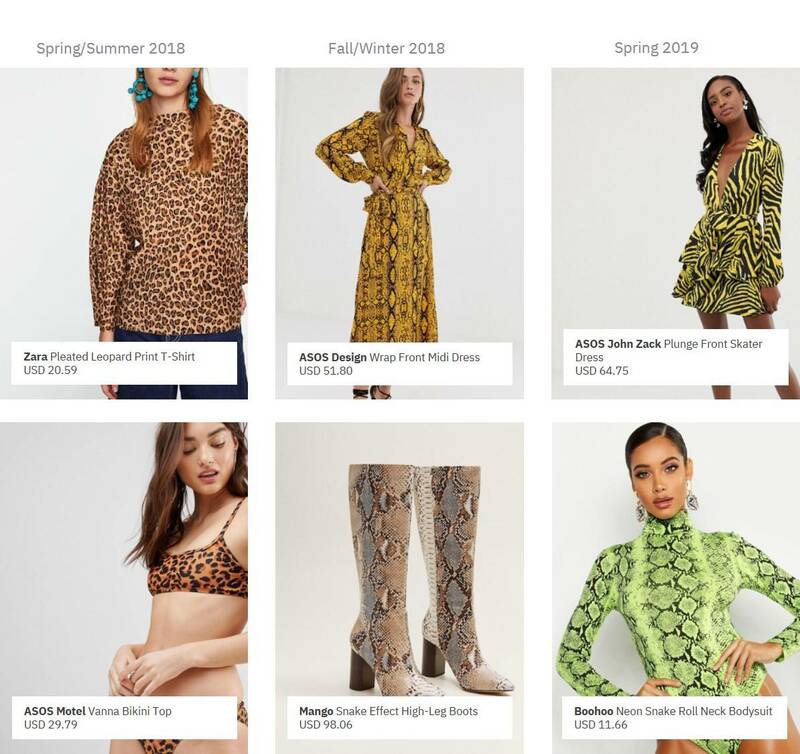 As retailers continued to expand animal print offerings in SP19, leopard, snake and zebra print in loud design and bold hues such as neon green and striking yellow were making headway, as seen in ASOS and Boohoo. Overall, leopard print dresses and tops in classic colourways continued to be popular throughout the season but the punched-up version in bold and striking colours were recent favourites among consumers. Overall, the leopard print also dominated the bestsellers for menswear, followed by snake print. The biggest transition spotted in the bestsellers was on the design front, from whole animal design to incorporating just spots or patterns with solids or mixed patterns. The bestsellers in SS18 saw mainly fun and large print design with illustrations of animals such as snake, leopard or tiger featured on the garment (as seen here on River Island). Colours offered were conservative in shades of black, brown and grey. As runway designers continued to showcase heavily the animal print trend in menswear, clothing items with wild animal prints such as leopard and snake in retail saw positive response in FW18. Though the reception on animal prints in menswear in SP19 was rather soft on the retail front, leopard and snake prints continued to be the most popular choices among consumers. New ‘Neutral’ Stays: Some trends only last a season but the animal print trend proves that it is here to stay by dominating the runways, and earning the title as the new ‘neutrals’. Although animal prints accounted for a small percentage of the fast fashion assortment, the abrupt jump of newly launched items in Fall/Winter 2018 coming from a steady build in Spring/Summer 2018, and continuing on into Spring 2019 with higher newness than in last year’s Spring 2018, indicated that it is the strongest and most prevalent trend transcending across different seasonality. Bold in Fast Fashion: In addition to leopard prints and coveted snake printed items, the fast fashion segment has decided to go bold, entering Spring 2019 by offering progressive interpretations of the runway looks with increased newness across zebra, giraffe and tiger prints including bright and neon coloured iterations. Womenswear Focused: Though animal prints have drawn increased hype over menswear on the runways, the same sentiment is not shared on the fast fashion retail front. The number of newly added animal printed items for menswear depreciated over the past two seasons and the fluctuations in performance suggested that the trend could only be sustainable for womenswear. Know Your Audience: While animal prints might be everywhere from the runways to the streets, simply adopting the trend without having a clear understanding of existing consumer demand or which consumer group to target, can be a costly affair if sales failed to materialize. Retailers like ASOS, whose customers are mostly in their 20s and highly influenced by social media hype, managed to fully monetize and benefit from the animal print trend, resulting in a 28% increase in profit from the sale of 1.3 million animal print garments in 2018. The retailer was savvy in extending the trend lifecycle by expanding its animal print offerings to include a diverse assortment with snake, zebra, giraffe, cow, and dalmatian. Start Small: Claimed as the new ‘neutrals’ coupled with strong media hype surrounding animal prints, it is tempting for brands to jump on the bandwagon to leverage on increasing acceptance on the prints. launch to trial in peak performing months as proven by data, i.e. summer season from April – July.